Use this Choice 5 qt. stainless steel mixing bowl with its silicone non-slip base to add a great, useful addition to your kitchen. Featuring a thin coating of silicone on the bottom, this bowl is a step-up from your typical mixing bowls as the base stops the bowl from sliding around on your counter or workspace. This helps prevent common kitchen spills that can occur when stirring or moving about a busy kitchen. Plus, since the non-skid base is made of silicone it resists heat and chemicals better than plastic for long-lasting durability. My go to prep bowl. I like the depth of this bowl, and that the black doesn’t fade even when put through industrial dishwasher. The not stick doesn’t hold lint either which is nice, because that has been my problem with other brands in the past. I love this mixing bowl. The silicone non-slip base is genius! it keeps the bowl from slipping and sliding on counter tops and reduces noise. Excellent product for the kitchen! I ordered the whole set of these stainless steel mixing bowls, and utilize each size on a regular basis. Easy to clean and easy to store. Very happy with my purchase, and I recommend WebstaurantStore to everyone! These bowls with non-slip base are awesome. They are heavyweight enough that they don't slide around easily, or tilt over. I love marinading chicken wings in this bowl. You toss them with your favorite sauce, then put your (golves) hands in and cover all the wings. The edges are high enough that no wing accidentally escapes! The 5qt stainless steel bowl with silicone bottom is the perfect size for mixing large batters. Can easily mix 2 batches of brownies at once, and the silicone bottom works great to stop it from sliding all over the counter. Definitely one of the most versatile bowls in the set and I'll be buying a 2nd as often as I use it. Awesome bowl. List of uses for this size is endless. My go to for everything from making batches of salad dressings to making brownies I small batches. This has worked great for us. The non slip bottom is great for the kitchen and we use it for a ton of different things. These bowls are the perfect size set to handle all of your home baking needs (items: 922MB03-EA, 922MB05–EA, 922MB08–EA, 922MB15–EA). They look great and the non-slip design is so helpful when using a hand mixer. I love this bowl. It's huge yet lightweight (until you fill it with a double batch of cookie dough at least!) and the nonslip bottom is fantastic. I particularly like that it's deep, with a wide base and steep walls. For some reason so many large bowls are really shallow, so electric mixers shoot batter or cookie dough everywhere. Not the case with this bowl; whatever you're making in it, it will keep it contained. I really wanted this bowl to use with a hand mixer for two reasons: 1) it has deeper sides than some of the other mixing bowls, so batter doesn't splatter out of the bowl while mixing and 2) the non slip base is ideal for hand mixing on counters. I'm definitely very happy with the purchase! It's so much easier to mix up thick batters and dough in this bowl when it has the rubber bottom and it grips the counter so you aren't trying to hold the bowl and your spoon at the same time. We purchased this bowl to mix batter for our KitchenAid 5-Qt. Stand Mixer and it's the perfect size. It's also highly durable and easy to wash. These bowls have a fantastic mirror finish inside and brushed steel outside. The lip makes pouring out of them easy and helps reduce messes. The non slip grip on the bottom is very sturdy and helps a ton. The 5 quart heavy weight stainless steel bowl because it is deep enough that one you are mixing you will not have any splatter coming out the top. Tried one to see the quality and it is absolutely perfect, now we will be ordering a bunch of these for daily use, cant go wrong. Great size bowl that fits a multitude of needs. The non slip base is an must for our childrens cooking school. It's nice to have the extra degree of security and not worry about items sliding off the table. The stainless steel is great, easy to clean and not too heavy. But it is thick enough that I feel it will last a long time. This is a good size for tossing salads or veggie prep for cooking. This 5 qt. mixing bowl is awesome! It is 'heavyweight' by design, yet light to lift and handle, which is great for me since I am arthritic and have limited strength. The bottom grip really works to keep the bowl from scooting around while mixing and stirring and I really appreciate that feature. This bowl is larger and I use it for potato salad and double batches of cake mix. I'm sure you will have so many uses for this great stainless steel mixing bowl!! Great Bowl! unfortunately can't stock them on top of each other, so hard to take them apart. I order 50 back on may and so far I only received 23, just got an email that the 27 will be ship on 8/31 :( our busiest time is over next week. I will have to keep them for next year. My favorite bowl, ever. The no slip bottom is great when you are mixing heavy ingredients, but I especially like how deep the bowl is. My go to on everything I make! This mixing bowl looks and feel expensive. But the price on here is not! The bottom grip is wonderful. You don't know how much you'll appreciate it until you use this bowl. 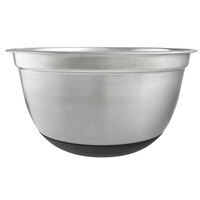 As I've written in previous reviews, I have two sets of these stainless steel/bottom grip bowls in my home kitchen. I use at least one of them every day and they have held up incredibly well. You definitely will not find a better price for this type of bowl. They are easy to handle/maneuver, look good on the table as a serving bowl, and clean up well. Nice size and design of heavy duty high sided bowl. Love the non slip grip for working the contents on a counter. Will buy more! LOVE!!!! LOVE!!! LOVE!!! Excellent quality and excellent price. Another wonderful bowl from the Webstaurant store, very heavyweight and durable. I love that the bowl doesn't go skidding across the smooth surface as you're using it. Love this 5 Qt mixing bowl. The bottom is silicone and will stay put on the counter when in use. It is made of durable heavy duty stainless steel, has a nice finish and design and the large rim makes holding it securely easy. Wonderful bowl! Great product overall. The circumference of the bowl is just the right size and the height is deep enough to for washing vegetables or mixing salads, dough etc. the rubber bottom is great for non slip. I got this bowl, plus the 3 quart and the 1.5 quart ones, to replace an old set of melamine bowls. I love how light they are, and the non-skid base keeps tem from scooting everywhere. Nice firm mixing bowl with non-slip base. I use it to make whipped cream and it is tall enough to keep the cream from splashing everywhere. It also doesn't get scratched very easily. This is a great bowl. We use it for mixing baking ingredients and soaking nuts overnight. The non-slip base really makes a big difference compared to regular bowls. Practical, resistant, and nice looking. We put them in our self serve bar for salsa and jalapeños, but I'm sure there are a lot of uses for them. Stackable and very lightweight. We bought this to replace glass mixing bowls and lower quality stainless bowls. I am so glad we did! You can tell by the weight it is of good quality. The non-slip base was a no brainer in helping us decide and it does it's job! I'll be getting the 3 Qt size soon! The gripper is the best part of the bowl...I never have to worry about the bowl moving around as I am mixing batter. As always, stainless steel is super easy to clean. Great bowl for mixing and also to sift powdered sugar in. It stays on the counter while you mix and blend which makes clean up much easier. Great size. Great price. Great bowl set. These bowls are the perfect solution for all your mixing needs. Do not worry when looking to buy -- they bowls are fantastic. The bowl itself is good--great quality. I purchased one of each size: 1.5, 3. and 5 Q. In hindsight, I think the best value was the 5 Qt because the non-slip base helps with mixing larger batches of dough, flour, etc. It's not really necessary to have the non-slip grip for the smaller sizes, and hence I would just purchase normal stainless steel mixing bowls for the smaller sizes--they are cheaper! OMG! I recieved my order in 24 hours! Besides that this bowl is great! I just used it to mix batter for a 2 layer cake no slip or sliding here! This mixing bowl is pretty thick for stainless steel. What I like most about it is the rubberized bottom that keeps the bowl from moving while stirring. Very convenient and a great value. This bowl is perfect for everyday use, not too heavy, good size. I got 2 of these, might order more. Will look into different sizes. Love this bowl! Stays put as I am mixing cake batter, doesn't slide around all over the place. Well worth the price. Very sturdy bowl. The 5qt heavyweight stainless steel mixing bowl with bottom grip/non-slip base is an excellent purchase. It is sturdy and attractive, and the bottom grip keeps the bowl from sliding when you are mixing a stiff dough. I am please with the purchase. These bowls are just gorgeous. I bought them to use as mixing bowls for my daughter as she's setting up her new kitchen and I'm back on the site to buy myself a set! They grip to the counter pleasingly and best of all they won't scratch the counter. Love these- 5 stars!